Hope you have all had a good weekend and are ready for the new week. Why not take a look at the challenge blog and see the beautiful creations by the Design Team and maybe join in with our challenge and get a head start on your Christmas 2018 cards!!!! It's certainly cute Pat and the papers and design are beautiful. Fantastic card, Pat - this image is just adorable and I love the swirly paper and big red bow. It's minus 3 here today - and feels it too...!! Hope the snow isn't too bad for you. 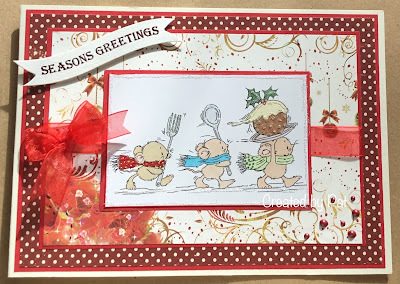 Simply gorgeous is your card and what a fab image you used too!. A fabulous card Pat, such a cute image and lovely papers. Sweet little Mice Pat and great with all the warm seasonal reds.